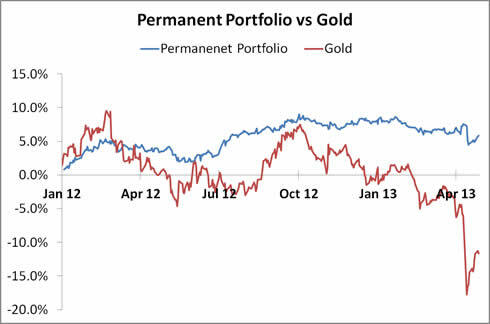 How did the drop in Gold price affected the Permanent Portfolio? The simulated Permanent Portfolio was started in Jan 12 and despite the drop in gold price during the course of the year, the Permanent Portfolio had held up its value. Most importantly, while Gold price tanked in Apr 13, the impact was a slight dent to the overall portfolio even though it held 25% in gold. If a Permanent Portfolio investor looks at the gold price, he or she will definitely be fearful. But if he or she looks at the overall portfolio value, it was just another day in his or her life. Nothing interesting. This is why I keep emphasizing that most investors CANNOT take drawdowns. The stability in Permanent Portfolio is to help most investors who are easily affected by price drops to stay invested. In fact, the more volatile the individual asset class, the better. This gives more opportunities for Permanent Portfolio investors to re-balance the portfolio and when they do that, they are buying low and selling high to reap the capital gains. Have the right perspective. The Permanent Portfolio is designed to be a passive method, that’s time-tested to survive severe draw-downs of one asset class, in this case gold. In 2008, it was equities. It is also a disciplined way of “buying low” now that the equal weight of 25% have probably been breached maybe to the point of one of the asset classes exceeding 35%, triggering a rebalancing. At the mean time, it would be comforting to know that there is a likely bottom for gold. Research points to US$1,100 being a reasonable floor, due to the costs of digging gold from the ground. It seems that US$900 is below cost. And for miners to survive, and supplies to be met in the future, that’s the likely floor. Investors fail because they fail to stick to a plan. If your plan was to use the Permanent Portfolio, then stick to it. Rebalance when the 35% trigger hits. So in simple words, people following this, should start buying gold since the value of their gold holdings in their permanent portfolio has dropped ? In this case, Permanent Portfolio investors will sell some stocks or bonds, or use cash, to buy gold if the gold component drops to 15% of the total portfolio value. First of all, thanks for making time to continue with this blog. very informative. I just started using the Stan Chart Online Trading to DCA my STI ETF (G3B). Since there is no commission per transaction, I buy 1 lot (100 shares) every monday. So far I have invested around $5k, with an average of $3.21 per unit. Not very good (as of writing, the STI ETF is $3.08), but I will stick to this since I know DCA will continue to work for me. My question is, how do you incorporate DCA into the PP? I have around $1.3k every month to invest. I have an emergency fund of $8k I keep in the Stan Chart Bonus Saver for its generous 1.88% interest. Should I use start using this to buy Gold and the 30 year bonds? I am contemplating either the UOB Gold A/c or the SPDR Gold Trust. My worry is that apparently Stan Chart has a horrible USD-SGD exchange rate and the UOB Gold A/C might be too expensive to use since i wouldn’t be buying a lot of gold to justify the 1.44g/year fee.